This female finch is no comparison to my colourful red cardinal! 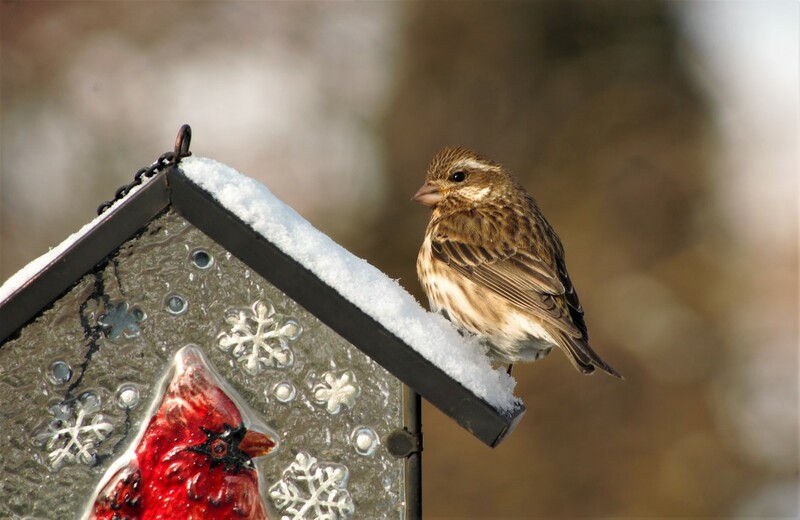 Thank you for your comments and favs on yesterday's "Purple Finch", he made it to the PP! Its a cute wee bird and has sparrow colouring but you can see the finch beak! Must fav - adorable capture! Sweet little bird! You're still getting snow? Thankfully I think we're finally in spring! your photos have been most impressive of late, kathy. She seems to be watching it -- great details in the 'real' bird. Aw. She's lovely. Great catchlights on her eye. Great light and cutie of a bird plus some bokeh in the background! Sweet capture and great details. They are eyeing each other up! Beautiful shot of him. Lovely focus on this sweet bird Kathy.